MORTALICUM and STONEGRIFF at two festivals. Our Swedish Doom Metal representation, namely MORTALICUM and STONEGRIFF are confirmed for two festivals in March and April. 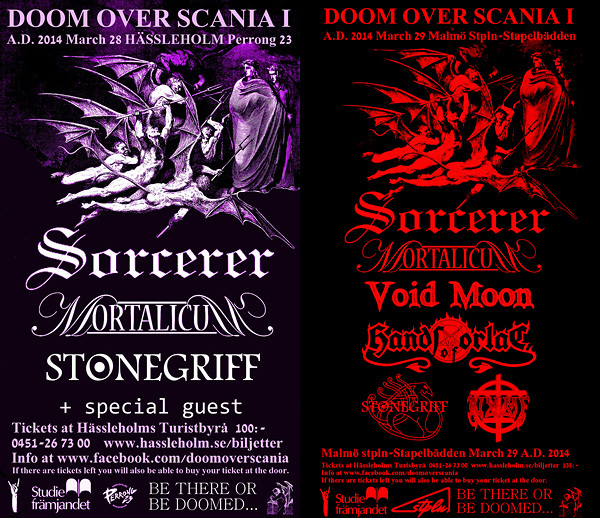 The first event is a new festival in the south of Sweden, Doom over Scania that will take place on March 28th and 29th, 2014 in Hässleholm and Malmö respectively (check the pages of these events here and here). On the second day MORTALICUM and STONEGRIFF will share the stage with SORCERER, VOID MOON, HANDS OF ORLAC and NYMF (while on the first day just with SORCERER). If you buy your tickets before February 28th, you can win a Doom Over Scania festival T-shirt (more info on the festival's Facebook page). The second event is in Austria: the 6th edition of Springdoom Depression festival, organized by SoundWall Entertainment (which is also the organizer of Doom over Vienna festival), and it will take place on April 5th, 2014 at Escape Metalcorner in Vienna. 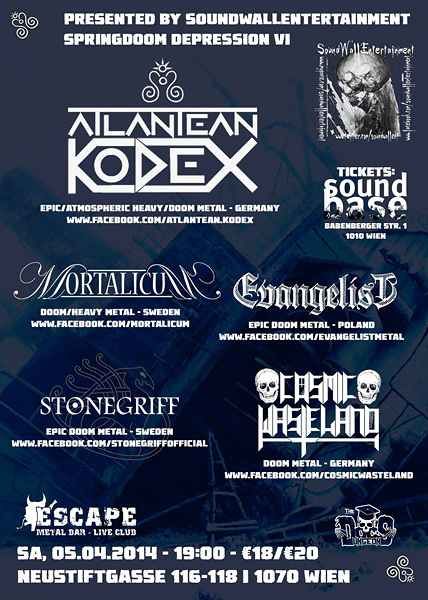 MORTALICUM and STONEGRIFF will play there with ATLANTEAN KODEX, EVANGELIST and COSMIC WASTELAND. And you can expect yours truly to be at this fine event as well. STONEGRIFF's debut album "Prologus Magicus" was released in August last year. MORTALICUM already have two full-length albums: "Progress of Doom" (2010) and "The Endtime Prophecy" (2012), and their third one "Tears from the Grave" will be out this April.